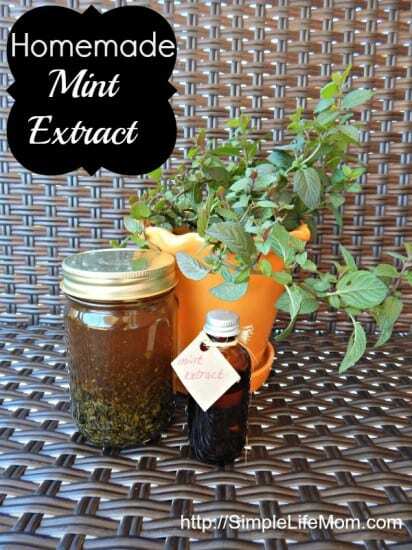 Homemade Mint Extract is an easy and fun gift to give to people around the holidays, birthdays, wedding gifts, and more. 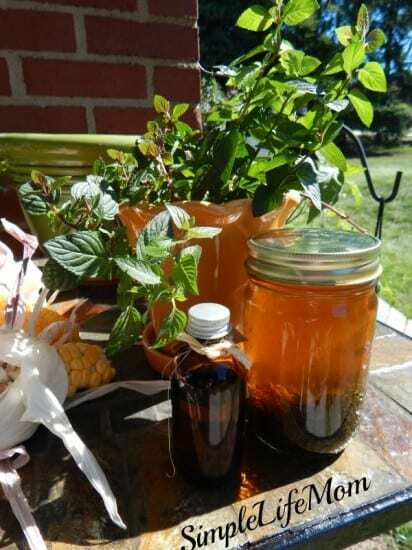 Like Homemade Vanilla Extract, fresh Homemade Mint Extract needs to be started ahead of time. But, where as Vanilla needs to steep at least 4 months, Mint only needs 1 month! That’s over before you know it! Then you can package it up in a cute little bottle and put it in with your other homemade gifts like the Homemade Vanilla Extract, Homemade Soaps, ooooh or how about Homemade Lotions?! Extracts are always easy to make if you grow the plant yourself. And mint is a prolific grower. It will take over your yard if you let it. So far I’ve made Vanilla, Mint, Stevia, and Lemon Balm extracts (the lemon balm is for a tincture I’m making), and they’ve turned out fabulous! What else should I try? I’d love some ideas. Prepare mint leaves by making sure they are clean and dry. Bruise leaves between fingers and add them to a jar, stuffing them down to ¾ full. Pour in enough vodka to cover the leaves. You can use organic vodka if you are concerned about gmo's. Or, just buy vodka that was made in a country that has banned gmo's, like New Zealand or Ireland. Close lid and place in a dark place for 1 month, shaking occasionally. If you have dried mint leaves that you have kept from your garden, they can be used instead. Use the dried leaves in a ratio with the vodka at 1:4. So if you use one cup of vodka, use 1/4 cup of dried leaves. The dried leaves will need to steep for four months instead of one. Use this wonderful mint extract in your favorite baked goods and candies, apply it to your temples when you have a headache, or drink 1 tsp when your stomach is upset or if you have gas. 😉 It also helps with bad breath. So many uses! This is great! I’ve been wanting to make some extracts at home. Recently I saw a recipe for homemade vanilla extract that I need to try, too. Another great reason to buy Vodka! This is a great idea. Mint has such wonderful properties. When we have upset tummies it really helps . I also bet it tastes fantastic in baked goods. Can’t wait to have this on hand for holiday baking. Love mint! Never realized you could make extract. Pinning! This is amazing. My sister and I are going to get right to it and make our own! This is great..thanks for sharing!! This is excellent, thanks! I use so much mint extract in my holiday cooking and I can’t wait to try the homemade version now. This is a great way to make all the fresh mint I buy for its flavor and health benefits last longer! I love growing mint!! This will come in handy! I love the smell of mint. Looks great! Mint is one of the plants I can grow without killing it. Thanks for the idea & how to! Love your idea. Just wondering is there anything else I could use to preserve the mint instead of vodka because I try to stay away from any alcohol products completely? I use mint for so many things and if I could find a way to preserve without he vodka it would be wonderful. I have the mint growing and wanted to find a way to preserve before it dies for winter. Thanks so much for sharing on Real Food Fridays. Will pin twit & share on google. Yes you can. Instead of the alcohol, use 1/2 water, 1/2 Apple Cider vinegar. The vinegar will help extract the oils and flavor from the mint leaves and help preserve it. Love this idea! So simple too. Interesting. I love making my own vanilla extract but I’ve never tried any other extracts. I was just looking at my bushy mint plant and wondering what to do with its abundance before the first snow comes. Thanks for the idea! Going to try the vodka free recipe since I already have apple cider vinegar. And I won’t feel weird giving my kids a spoonful when their tummy aches. Sounds good. I imagine you can also put it in a pot on low for 20 minutes without letting it boil (like you do with stevia) to cook off the alcohol and strengthen the flavor. I haven’t done that with mint though…. I made some of this and it’s wonderful. Mine turned out just a bit bitter, however. No problem, though, because a touch of honey sweetens it up! I have also made orange extract the same way – and lemon, almond and walnut! The orange extract is wonderful. I use the mint, lemon and orange extracts to make candies (among other things) with powdered sugar and butter shaped into small patties (think York Peppermint Patties) which are frozen, then dipped into melted chocolate. I know, I know – it’s not the healthiest thing to make, but at special occasions these disappear so quickly! The extracts are also great in flavoring quick breads, salad dressings, and even simple tea! I didn’t know you could use ACV instead, but that makes sense! Thanks for the info! Your Homemade Mint Extract looks delicious! This is a fantastic recipe and thanks so much for sharing it with us. Hope to see you again real soon at Full Plate Thursday! Why only leaves? I’m just wondering, I’ve made is with stem and wondered if I did something wrong. The stems can make it bitter. What a fun little project! I would love to try this, and it looks easy enough to expect good results for it as well 🙂 Stopping in from Hump Day Happenings! Thank you Megan. It is fun and easy, something you can do yourself or with family. Just a note to let you know that I have chosen you post as one of my features on Real Food Fridays Blog hop that goes live tonight @ 7pm EST. Thanks for being part of Real Food Friday and sharing with us! Thank you Marla. I look forward to it. Hopefully I’ll be able to grow mint soon so that I can try this. 🙂 Thanks for sharing it at Savoring Saturdays! This sounds wonderful! I do not have any mint plants but often buy bulk, dried peppermint leaves for tea at a local Mennonite store. I am assuming these will work too? Yes you can use dried Mont, but it’ll need to steep for longer, probably double the amount of time. I started my first batch of mint extract about 2 weeks ago, and now I am noticing the top 1/3 of leaves in the jar appear darker. Any ideas what’s going on? Probably just oxidation and/or if the leaves are bruised and absorbing the oils. That’s my guess. Continue to shake the jar every few days. That is so neat. It brings back so many memories of my great-grandmother and when she would make so many things homemade. That’s interesting! I love the smell of mind so it would probably be soothing on my temples for the smell alone. Wow! I had no idea I could make my own extracts and that they would be this easy! I have mint growing all over my yard! I definitely need to try this! Thank you for sharing! I didn’t either for the longest time. It really is easy too! Love this idea and making my own hand lotion would be great! That would make awesome stocking stuff gifts. Wonderful! I always thought you had to use fresh mint for an extract, but now I know what to do with the gallons of dried garden mint in my cellar! Thanks! How much fresh mint? Do you just fill the jar with it? Yes, you don’t have to jam them in there, but you’ll want to fill it pretty full and then cover with the alcohol. Make sure the leaves are fully submerged. I just made some almond extract yesterday. The hardest part is waiting a month. I can hardly wait. Mint is next on my list. I tried this with spearmint. All I taste is vodka. Ick. Did you use fresh spearmint? The type of leaves you use makes a big difference. You definitely need to let it sit longer. If it is still not strong enough you can heat gently over low heat from 20 minutes and then remove leaves and cool. Do you strain out the leaves or just leave them in the jar. Leave them in the jar until you are satisfied with the taste. Then strain and seal.